Very entertaining. It's just two guys talking about wrestling together, with no filter. Any inside info is just a bonus. This episode of WHW is presented by Season 5 of WWE SuperCard. Available now FOR FREE in the Apple App Store, Google Play and Amazon Appstore. Go to https://bit.ly/2UVkn2s for more information. Spring Break always meant one thing for the viewers of WCW Monday Nitro; an episode on the beach. In 2000, WCW took its traveling circus to South Padre Island in Texas for a show that would mark the beginning of the final year of the company. It was a show loaded with plenty of talent (and we're talking about the wrestlers), plenty of risqué videos and plenty of wrestling action. Conrad and Tony take on the beginning of the end of WCW as only they know how; WHW Monday style. As Jim Crockett Promotions headed to the Great American Bash 1988, they were pulling out all the stops (good and bad) to set up Ric Flair vs. Lex Luger for the NWA World Heavyweight Title at the Baltimore Arena. It would be the final year of JCP, as within six months they would sell to Turner Broadcasting. Join Conrad and Tony as they go back and look at the one hour version of World Championship Wrestling "Saturday Edition" with Jim Ross, Tony and David Crockett on the mic and a SPAM sponsorship...which just so happens to be Tony's favorite food. Join Conrad and Tony as they watch World Championship Wrestling's June 13, 1987 Episode. It was only one hour on TBS that week, but it was loaded with great interviews and action. Watch Dusty Rhodes and Tully Blanchard battle for the NWA World TV Title featuring a post match interview with TOMMY YOUNG!! and the first public appearance of Magnum TA since his tragic car accident of October of 1986. As our beloved show comes to it's supposed eventual end, Conrad and Tony are in rare form again as they cover Uncensored 96; featuring the The Alliance to end Hulkamania vs. Hulk Hogan and Randy Savage, the former MegaPowers in a triple cage of doom or some such nonsense. Widely panned as one of the worst PPV's of all time, let us not forget the importance of the Main Event, which pitted the aforementioned Mega Powers vs. Ric Flair, Double A, Brian Pillman (kinda), Kevin Sullivan, The Barbarian, Meng, Lex Lugar, Ze Gangsta (The Greek god of workrate, Zeus), and Kamala...err The Final Solut...err The Ultimate Solution. There were other matches as well including Eddy Guerrero and someone billed as "The Hulk Hogan of Mexico". But this is What Happened When Monday, so you will hear wedding talk, Graviton talk, and how one might get herpes from a frog splash. All this and more as we stifle our meloncholy feelings about Tony's decision on another hilarious episode of What Happened When Mondays with Tony Schiavone and Conrad Thompson! Conrad and Tony are back with one of their most outrageous watch alongs yet, as the countdown continues toward the end of our beloved institution. It's 1997 in WCW so things are coming to a peak in the most exciting way, and yet, terrible things are happening everywhere. Watch with the guys as they wax poetic on Prince Iaukea, High Voltage, Jim Powers, Mike jones, a drug dealing empire, a potential phony's bachelor party, and Hard Body Harrison. There are laughs galore, and we will enjoy them while we can, on another pentultimate episode of What Happened When Mondays with Tony Schiavone and Conrad Thompson! Because of the upcoming wedding, there are only a few shows left, and in this one, Tony and Conrad talk about Uncensored 1997 in one of our most hilarious shows yet. Mortal Kombat talk (and singing), american males talk (and singing), and much more outrageousness highlight what is yet another water mark as one of the best shows in podcasting history reaches it's conclusion. Then there the event: Prince Iakaua, Glacier, and of course the triangle match between the NWO, team Piper (the Horsemen), and team WCW (down a man because, you know, WCW) as the powerhouse promotion starts it's descent into the abyss. It's a funny, show, an unforgettable show, and it's one of the last, so enjoy this episode of What Happened When Mondays while you can! A company that held a Pay Per View with several of wrestling's future stars, a deep talent roster and a five star match... Is this a rib? No, it is the bipolar early 90's WCW, as Tony and Conrad cover WrestleWar 1991 featuring what many consider the best Wargames of all time, as well as many peculiar matches involving some of the greatest of all time. Is it Brian Pillman's coming out party, or Scott Steiner's? How did Tony know before almost anyone else that Dusty was coming back? Why did Larry Zbysko replace Double A in the main event? 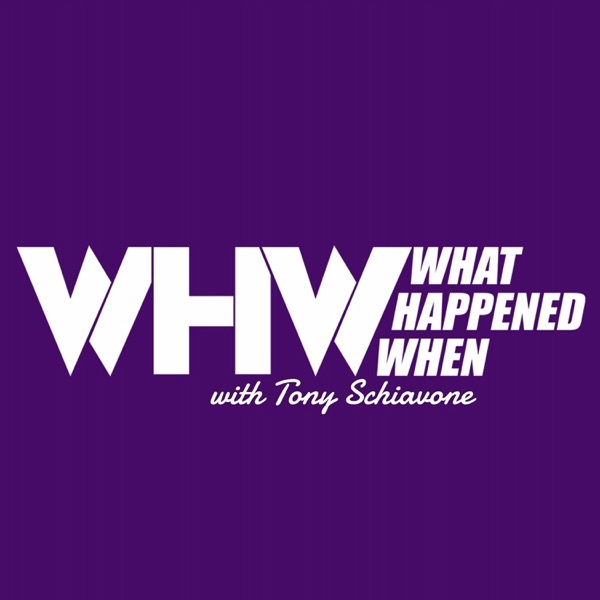 These are some of the questions answered as Tony recalls EVERYTHING from this era of WCW and provides maybe the best insight in the history of our fine show, on the, another fine episode of What Happened When Mondays with Tony Schiavone and Conrad Thompson! Coming off of their biggest Pay Per View ever, WCW begins the process of unravelling. But first, an interest worthy PPV in early 1998. Lots going on here including the Scott Steiner turn, dissension in the NWO, Booker T's coming out party makes this a fun watch and an even more fun watch along when you have the man who was there Tony Schiavone along with his cohort in crime, Conrad Thompson. The biggest wrestling star in the world a month previous, Bret Hart, sits home for this one, but that doesn't mean you should on another legendary episode of What Happened When Mondays... plus stay tunes for a fun musical tribute to two of our favorite WHW characters, School Board and Ham Cube. It was the best of times, it was the worst of times in WCW. Some of the greatest wrestlers, silliest gimmicks, and Wrestlecrap worthy promotional films. Join Tony as he revisits an interesting time in WCW history on another fun watch along with Conrad. "We want Flair", Cactus vs. Orndorff in a falls count anywhere, Muta, Wyndham, and of course let us not forget the infamous White Castle of Fear match featuring Sting and Vader while both were arguably at the top of their game. It's anybody's guess as to what people were thinking, but luckily for us we have Conrad and Tony to guide us through it on another laugh filled peek behind the curtain episode of What Happened When Monday! "You're out! You're no longer a horseman!" were the words spoken on the outset of this show in a perfectly executed angle that could only be ruined by a cataclysmic injury happening on the same show 2 hours later....and it did. Clash of Champions had it all, from Mick Foley's least favorite match against Mil Mascaras, to a young Undertaker as Mark Callous running the ropes like a thoroughbred and showing flashes of what was to become the Phenom. In addition the "mystery" of Doom may finally be solved against one of the greatest tag teams of all time: School Board and Ham Cubes. See everything great and terrible about WCW all in the same show as Tony and Conrad watch along and give you the companion piece you never wanted, but always needed on another hilarious and insightful episode of What Happened When Mondays with Tony Schiavone and Conrad Thompson! "We tried to warn you!" Crockett era fans (and even those later WCW fans who want to learn more of their wrestling history) can rejoice as Tony and Conrad dive into one of the most crucial events in wrestling history, the 1988 Bunkhouse Stampede. You have Flair vs. Hawk, Eaton vs. Koloff, and the finals of the main event: A come as you are battle royal-esque cage match where anything goes. But the real story was behind the scenes as Crockett and WWF were maneuvering and strategizing against each other, and this event was in many ways the most crucial battleground, with one decisive winner. You know it won't be all serious, because this is Conrad and Tony, who can make any subject fun as you will see yet again, on What Happened When?....... Mondays! Back by popular demand is Tony Schiavone answering YOUR questions! Conrad has a record of picking legendary questions that will give us some unforgettable answers as Tony fields questions like: What match does he wish he called, what current wrestlers would compose a Schiavone designed 4 horsemen, and of course he finally settles the bet on who would win in a shoot fight, Bob Caudle or Gordon Solie? Nothing is off limits, a Tony rant or two is to be had, and the "I don't know's" have minimum toleration on like, this special "Q and A" like, episode of like, What Happened When with Tony Schiavone! Souled out 1998 may be one of the best shows in the post Starrcade 97 era of WCW, and there is a lot to like about this show, so it's no wonder why. Flair vs. Hart, Giant vs. Nash Debacle, 8 man luchadore extravaganza, Rey vs. Jericho, and so much more. But this is What Happened when Mondays with Tony and Conrad so there might be a Lois run in, there could be a GOAT call in, and there definitely is unrelated rant or two relating to what is now a "collector's Edition" of a former WHW Mondays shirt. This will be an episode that will be talked about, and certainly one that should not be mossed. See for yourself as we start off the new year with bang on What Happened When Mondays with Tony Schiavone and Conrad Thompson! Join Tony and Conrad as they reveal never before heard behind the scenes stories about the creation of and life and death of wrestling's most maligned show of all time WCW THUNDER! Not only that, but be entertained as Tony and Conrad put this abysmal and catastrophic experiment through their hilarious judgement machine with the benefit of hindsight and hilarity! Definitly an episode not to be missed....this week on What Happened When Mondays with Tony Schiavone! Tony Schiavone was out of wrestling. Conrad Thompson had an idea for a podcast. This unique podcast documentary on WHW with Tony Schiavone takes you through the twists, turns, success, and evolution of one of the most unique podcasts in the world. From the beginning contact to the final result of the funniest most entertaining listens you can have, enjoy the backstory of the highlights of the show from Goldberg to Halloween Havoc 95 and all points in between. The show's most memorable moments, pivotal decision points, and interviews with Tony and Conrad as well as others in the WHW family are integrated with a musical backdrop to not only highlight a remarkable first year, but to celebrate and document Tony Schiavone coming home to the world of professional wrestling; on THIS special episode of WHW Mondays, The History of What Happened When! The "go home show" for Starrcade 97, This Nitro features the final build up for the long awaited Sting vs. Hogan and Bischoff vs. Zbysko matches the following Sunday, and also features the much talked about "NWO Nitro" segments which was universally hated and may have been a turning point in the Monday Night Wars. This is WHW Monday though, so in addition we have a Lois run in, Tony getting signed up for a new Job, a motorcycle mishap, and a non stop stream of laughs that can only be inspired by WCW and can only be delivered by Conrad Thompson and Tony Schiavone on a very special Christmas Day edition of What Happened When Mondays! Tony and Conrad return for another of their hilarious watch alongs, and this time they are watching Starrcade 1999! All of you Monday night war era fans are going to love this one, and Tony and Conrad really cut loose and have a good time, and you will too! Whether you watch along or just listen, you will laugh and be entertained by the craziness on the screen combined with an unhinged Tony and Conrad. On a serious note, while taping of this show occurred before the announcement of former WCW star and WHW Monday icon Tom Zenk's death on Sunday, the show includes a word from Tony on the passing of the former Mr. Minnesota, as well as a musical tribute at the beginning of the show, and a classic Tom Zenk/Tony Schiavone musical moment at the end of the show. All this and more on a very special What Happened Monday with Tony Schiavone and Conrad Thompson dedicated to the memory and the legacy of the one and only "Z-Man", Tom Zenk. It's Starrcade 1991, The Lethal Lottery! Find out what happens when Conrad and Tony cover what they discovered may be the worst WCW PPV of all time. But no worries, you are still in for a hilarious time as the guys poke fun at and examine the the miscue after miscue on this very memorable episode. There is no lack of laughs, and no lack of memorable moments! If you don't know what the Lethal Lottery was, get ready, because it was maybe the worst and most convoluted concept for a PPV which destroyed any fan interest that might exist in the product at the time. We know this is where Tony and Conrad shine, when they are covering a "very WCW" event. Also, Arn Anderson calls Tony during the show, and Tony picks up.. ON AIR! Feeling mischievous, they then call their friend Nature Boy Ric Flair on air! All this, and so much more on a great episode of What Happened When Mondays! Tony and Conrad are back with commentary on one of the most infamous PPV's featuring one of the most infamous angles of all time; Starrcade 1990 featuring the "reveal" of the Black Scorpion! Who was the Black Scorpion supposed to be initially? What was the deal with the magic tricks? How about that voice? This very strange event also featured a memorable tag team tournament featuring some familiar names in unexpected places, as well as some people we never had seen before or since. Most importantly this spectacular featured the return of the handsome, mulleted, golden voiced announce from up north. All in all it is another excellent canvas for the guys to analyze, poke fun of, and be mystified by on yet another pentultimate edition of What Happened When Mondays with Tony Schiavone and Conrad Thompson! Your new Thanksgiving tradition begins right now! It's the return of big time wrestling taking place after your favorite meal of the year! We start with one of the most memorable Starrcades of all time, but was it memorable for the right reasons? Is there any good reason to have a scaffold match? Has a big title match ever ended with an accidental groin hit? How did that UWF/Crockett merger turn out? There will be answers to these questions and more as Tony and Conrad cover, explain, and are sometimes perplexed by this classic event that took place 30 Thanksgivings ago; Starrcade 87, Chi-Town Heat. All this and the craziness and doo-doo talk we expect from our hosts Conrad Thompson and Tony Schiavone on this ground breaking, momentous, and delightful episode of What happened When Monday! After a year of peace it is time again for World War 3. Obviously the last one had a lasting impact. Listen (or watch and listen) with Conrad and Tony as they offer insight and background on the third "World War 3" (not to be confused with World War 6) World War 3, 1997. Has the camera work gotten better? Is there anyway to justify the budget? Is there any reason to have this many wrestlers doing so little for so long at the same time on PPV? What happened with Goldberg and Mongo? We know Mongo had no heat in the ring, how about in the back? So many questions and so many answers (including yours from twitter) are explored regarding truly one of the worst PPV's of the Bischoff era. Don't make Conrad and Tony suffer alone, join in their misery and be entertained and have a few chuckles on another very special edition of What Happened When Monday with Tony Schiavone and Conrad Thompson! It's time to fire up the WWE Network, press mute, and relive the... well... the not so good days of WCW in 1994. When you think of WCW don't you always think of Brutus Beefcake, the Honky Tonk Man, Hacksaw, and Earthquake? Me either. Well they're here now but guess who's not? Ric Flair. He lost a retirement match at Halloween Havoc in a failed attempt to pop a huge buyrate for WCW. Hogan's huge contract is set to expire at the end of the year, Savage is negotiating to come in, and there's a shakeup in the booking committee. Meanwhile Missy Hyatt is suing, Steamboat is fired, house shows are drawing 600 paid, Crockett is trying to start back up, the graphics department thinks Sherri is managing everyone, oh and Dave Sullivan is in the main event. Yes, DAVE Sullivan. Buckle up boys and girls, this is What Happened When with Tony Schiavone! Buy a shirt to support the show at www.LoisRules.com and Tony will call you! Plus, TUNE IN FOR A SPECIAL ANNOUNCEMENT! Tony and Conrad watch along to a great PPV from a low point in WCW history. The greatest talent in the world was there, but they would leave WCW before they reached their peak. Even though they are watching something good for a change, this episode has the crazy humor and entertaining listen you have come to expect from WHW and you might even enjoy watching this one! In addition to the one of a kind commentary and an 'apology' for the classless behavior of the past couple episodes (which is then repeated), you will find out exactly how long tony has left to live, as he celebrates his 60th birthday! All you expect and more (ready for another hotline? ), on this very special laugh out loud episode of What Happened When Mondays! If you liked last weeks show you will LOVE what you will hear this week in perhaps the most hilarious, entertaining. and controversial episode to date. Conrad and Tony are doing the real time running commentary/mocking/unbelievable tangents on one of the most memorable WCW PPV's of all time, Halloween Havoc 1995! We are talking monster trucks, The Dungeon of Doom, and of course "THE YETTAYYYYYYYYY"! This episode is one of our longest yet and is a "can't miss". See for yourself as you watch along or just listen to this outrageous episode of What Happened When Mondays with Tony Schiavone and Conrad Thompson! Tony and Conrad return to their very popular commentary format which is just as fun to watch along and listen as it to just listen to them make sense of all the crazy goings on in this PPV in WCW in 1997. From the 'Age in the Cage', To Tony being underwhelmed by the Mysterio/Guerrero classic, to much Tommy Young hijinks, this fun show will be informative, funny, and Tony's recall is on point! Watch or just listen along to what is sure to be another legendary episode of What Happened When Mondays with Tony Schiavone. On this very special episode of What Happened When, make sure to stay till the very end, because that is where the news making story of the year is! But don't fast forward because in the meantime, there is over two hours of Tony and Conrad running through a timeline of arguably the greatest wrestler of all time "Stone Cold" Steve Austin's time in WCW as "Stunning Steve". His arrival, his trials, his tribulations, and his departure from WCW are explored in great detail. Lady Blossom, The Hollywood Blondes, the Dangerous Alliance, and much more are covered in this particularly pungent epidote of What Happened When Mondays with Tony Schiavone! Tony and Conrad are "At the Movies" this week, doing alternate commentary on the "classic" WCW engulfed movie: Ready to Rumble! Learn all the insight from a star of that movie Tony Schiavone as they watch it with you and give their own take on the "Mystery Science Theatre" concept! In addition, find the REAL story of Ton'y involvement in the David Arquette title reign, poop stories, what the wrestlers thought about it, injuries, and so much more. It is an episode that you definitely don't want to miss, so grab your popcorn, get the DVR going and watch Ready to Rumble with your movie dates Tony and Conrad on this episode of What Happened When Mondays! Tony and Conrad return to do their very popular live commentary on this episode of What Happened When Mondays with Tony Schiavone. This week they will cover a Nitro where it seemed EVERYTHING was going on! You had the Wolfpack, The Ultimate Warrior, The return of Ric Flair, The Steiners Feuding, Jericho vs. Goldberg and so much more filling out this overly packed edition of Nitro. On top of that, you finally got to see Bret Hart face Hulk Hogan for the first time in a match that was years in the making, but seemingly moments in the booking. Hear backstage gossip, be stunned at the revelation of what exactly was the second highest watched match of all time, why these were the "Wonder Years" of booking, and how to relieve yourself under a wrestling ring in this funny and insightful episode of What Happened When Mondays! What Happened When Tony Schiavone left Turner to move north and work for Vince McMahon. On today's episode you'll learn more details about the WWF studios, the differences in working for Crockett or McMahon, etc than you've ever heard! WOOOOO!!! The tip of the glistening iceburg that is "Nature Boy" Ric Flair's career, in and out of the ring, is the subject of this episode of What Happened When Mondays! Learn how Ric is responsible for Tony's career in wrestling, Ric's early world title victories, how he felt about the finish in the Starrcade 1985 match against Dusty Rhodes, and what Tony's very favorite Ric Flair match that he called was. But really, this episode is about the stories... The naked truth about Tony and Ric's partying days, the hairy trouble that Nature Boy insisted on getting into, several "Marriott" stories, and the truth about "really knowing" Ric. He is a survivor, he is the greatest of all time, and he kicked out at two and is staging the biggest comeback of his life. Ric Flair, from jet flyin' to inspiring, is the subject of this very special episode of What Happened When Mondays! This week Tony and Conrad cover Fall Brawl 1996, which captured the hearts and minds of many, including a young Conrad Thompson who made this his very first PPV purchase. How did they change the setup to accommodate two Stings? What does an Ice Train and Scott Norton submission match look like? How did this PPV jumpstart the Monday Night Wars? All this plus the answers to many questions from last week's infamous show: What was the deal with the music? Why was Conrad particularly hilarious? Was Tony choking really a work? All questions will be answered and all truth brought to light on this very special edition of What Happened When Monday! On this episode of What Happens When Mondays, Conrad and Tony provide commentary and insight alongside a viewing of Wargames 2000 which actually occurs on a NITRO on September 4th, 2000. Did the three tiered cage work? Did Russo work with a concussion? How many men in white face paint can you fit in the ring at the same time? All questions are answered and hilarious sidebars are explored, and Tony almost dies on the air for failing to properly drink a glass of water on this very funny, informative, and almost tragic edition of WHW Monday! Fans took to Facebook and Twitter and asked Tony every question imaginable, and Tony answers them all! Join Conrad and Tony on this episode where Tony chooses "his" Horsemen, gives his opinion on Vince Russo, finally answers how he felt about giving away taped Raw results on Nitro, reveals what the deal was with shaving that beautiful mustache, and much much more! In addition, a surprising 'where are they now' answer featuring an American Male and the first and maybe only run in from Lois Schiavone make this an episode that is not to be missed! This week, Conrad and Tony talk about everyone's "Mount Rushmore" wrestler, The Enforcer" Arn Anderson. Hear the story of Arns career from the very beginning of his days at Crockett all the way up to his famous "my spot" retirement speech. Hear the fun stories, things you may not have heard before, numerous Arn quotes and much more on this episode of What Happened When. An outdoor PPV on a Saturday with free tickets. Who booked this?! What if rained? Was Bobby drunk? Did the fans throw rocks at the Harlem Heat? Who dressed Tony like a member of the Village People? What's your favorite Ice Train story? All of this and more as we discuss nearly two hours of Hog Wild 1996! Conrad and Tony provide real time commentary and insight on on one of the most pivotal Nitros of all time: The night Lugar defeated the NWO and Hulk Hogan for the Big Gold Belt. Also, the mystery of the Villanos name finally explained, theme music for the giant created on the spot, the first three hour Nitro, and a story about the Barbarian's special requests. All this and much more on a special Nitro commentary track edition of What Happened When with Tony Schiavone and Conrad Thompson! What REALLY happened? Why did Bobby bury Tony in his book, his shoot interview, and everywhere else for more than 15 years? Did Tony really have a problem with Bobby paying tribute Gorilla? Did Tony demand his chair be higher than Bobby's? Tony sets the record straight once and for all. What Happened When Randy Savage left the WWF? Tony weighs in on the Stephanie rumor, the divorce, the heat with Hogan, the feud with Flair, and why Savage REALLY won the World Title at WW3 1995. Enjoy over two hours of the "Macho Man" in his first year with WCW plus discover the name of Conrad & Tony's new tag team! What Happened When Col. Parker wanted Sid and Vader to win so badly that he hired a dwarf wearing an eye patch to disguise himself as a shark in order to place a bomb on Sting and Davey Boy Smith's boat when they were on an island for a charity volleyball match with children? Yes, this is WCW in 1993 and we discuss it for nearly two hours! Nearly two hours of Tony Schiavone answering all of your questions! Follow @WHWMonday on Twitter to get involved in the conversation next time. For now, enjoy everything from Tony discussing Bobby Heenan to playing FMK and more! "Hulk Hogan, you can go straight to hell!" What Happened When Hulk Hogan shocked the wrestling world and turned heel to form the nWo? Who knew and when? What was the backup plan? What was the reaction backstage? Did Heenan have heat for his line? Does Tony consider this the most important PPV in WCW history? All this and more in a very special WHW! Ole and Luger are out so what's next for the Horsemen? How did Arn & Tully's departure go down? Kendall Windham, Butch Reed, Hiro Matsuda, the Yamazaki Corporation?! "What's causin' all this?" Find out in two more hours of Tony talking about the Four Horsemen! Journey back to the 1980s as Tony and Conrad look at the Four Horsemen! What Happened When WCW ran their very last Pay Per View? The company would run their final show just eight days after this. Was it "too little, too late" for WCW? Finishes for every match, Luger & Buff going into business for themselves, lots of blood in the main event, and more in the last "hurrah" for WCW! What Happened When David Arquette defended his World Title in a triple cage, Shane Douglas finally got Ric Flair in the ring, Sunny was stripped on PPV, Hugh G Rection was born, Hogan wrestled Kidman on PPV, and Mike Awesome threw Kanyon off of the cage?! Were there any swerves, bro? ONLY in WCW 2000! What Happened When the Vince Russo era WCW held a tournament to crown a new World Champion in Toronto? Bret Hart, David Flair, Filthy Animals, Revolution, Screamin Norman Smiley, Oklahoma, Berlyn, and so much more crazy '99 WCW to discuss with Tony Schiavone! What Happened When WCW booked Hogan-Warrior II in a match Meltzer gave "-******"? With the Steiners facing each other, Hall vs. Nash, Bret vs. Sting, Hogan vs. Warrior, Goldberg-DDP how could this show miss?! Well it could go too long, folks miss the main event, and thousands demand refunds. Only in WCW. Don't miss a stinker of a story about the Giant too! What Happened When the nWo "killed" the Horsemen in 1997? The famous Horsemen "spot" segments, never-before-told Arn Anderson stories, Steiner Brother stories you need to hear, and a Klondike Bill story you'll wish you hadn't heard! Stay tuned to the very end for a ****** remix! What happened when... 60 men slogged through 3 rings, WCW had some intergender wrestling action, Chris Jericho fought a ref, Ultimo Dragon battled Rey Mysterio Jr. and Hulk Hogan got paid a ton to do paperwork? It's the 1996 edition of WCW World War 3! It's 1995 and WCW decides to get extreme with a pay-per-view marketed as Uncensored. What happened when WCW booked a King of the Road match, Ric Flair goes extreme in drag, Hulkamania with a man teased as the Ultimate Warrior (but not really) battles Big Van Vader in a leather strap match and more! It's unsanctioned, unauthorized and definitely unbelievable. It's Uncensored 95! Finally Hulk Hogan faces Ric Flair for the World Title! Steve Austin battles with Ricky "the Dragon" Steamboat for the WCW U.S. Championship and much more! It's the first-ever Bash at the Beach! What happened when... WCW booked Spin the Wheel Make A Deal as part of the main event attraction for Halloween Havoc 93? Find out as it involves Big Van Vader battles Cactus Jack! Also, Rick Rude defends the WCW International World Championship against Ric Flair and yes, the Shockmaster even makes the line-up. Pack some One Wipe Charlies as Tony and Conrad take a look at a wild night in New Orleans. What happened when WCW booked Spin The Wheel Make The Deal in 1992? It’s a very strange edition of Halloween Havoc and Tony and Conrad fearlessly look back at it on this episode sponsored by BlueApron.com! Fire up the podcast and listen to uncle Tony and Conrad take on your questions! In the summer of 1991, WCW head honcho Jim Herd plays hardball with Ric Flair... and the consequences forever change WCW and ground zero was the 91 Great American Bash. Tony and Conrad guide you through a very strange night in Baltimore. Sting vs. Sid Vicious! The Black Scorpion strikes! Steiners and the Nasty Boys tear it up! What is up with Little Richard Marley and the Fabulous Freebirds? DOOM vs. The Horsemen! It's a can't miss episode with Tony and Conrad, slapdicks! Tony Schiavone and Conrad Thompson talk about the historic and tragic final WCW Monday Nitro from March 2001. BANG! What happened when DDP unleashed the Diamond Cutter on WCW and defied age and the odds to become a top star in the company? Let's find out with Tony and Conrad! What happened when Jim Crockett Promotions produced its first ever live Pay-Per-View featuring Lex Luger chasing Ric Flair for his coveted NWA World Championship belt? What happened when Jim Crockett Promotions went head to head with the WWF's WrestleMania IV with a free live cable broadcast called Clash of the Champions? Sting vs. Flair! The Road Warriors! Dusty Rhodes! Barbed wire! The Midnight Express and more! Tony and Conrad break it ALL down! What happened when the New World Order was so on fire, WCW decided to produce a nWo PPV in 1997? Tony Schiavone and Conrad Thompson brave what would be a strange PPV experiment for Turner Broadcasting. Fire up the superstation of podcasts for it's premiere episode as the Voice of WCW Tony Schiavone and his podcasting tag team partner Conrad Thompson look back at Bill Goldberg's run in WCW.